Do you often ask yourself what your calling is? Your professional calling? I’m not talking about your spiritual calling, your calling to your God, but rather your calling to a profession, a career. Not merely a job. Something that you have such a passion for that you could almost do it without getting a paycheck – if only you didn’t have rent or a mortgage to pay. Or even small mouths to feed. And medical coding may have been one of those curiosities. Maybe you lost someone in your family, or someone you were close to became ill and you wished there was something you could do to help them. Or maybe you watched a medical show on TV and became interested in medicine through watching surgeries. I know I have. This interest led me to look into various careers in healthcare. Previously I had transcribed medical records, and I worked in a hospital admitting department for a while. Something about healthcare really fascinated me! No, I wasn’t able to fix their medical problems because I wasn’t a doctor, but I could somehow feel like I was helping them in a roundabout way by making sure their medical records were correct. I also knew I was somewhat of an introvert and, as much as I liked helping others, my interest was more in the behind-the-scenes kind of thing. This brought me to looking into medical coding. It seemed like a natural progression for me based on what I had done previously in my career. So my point is that we all learn about our passion through life experiences, feedback from others, and self-reflection. If you go to sleep at night thinking about healthcare and medical coding, and you wake up with thoughts of it again in the morning, or just in the afternoon, this may be your professional calling. 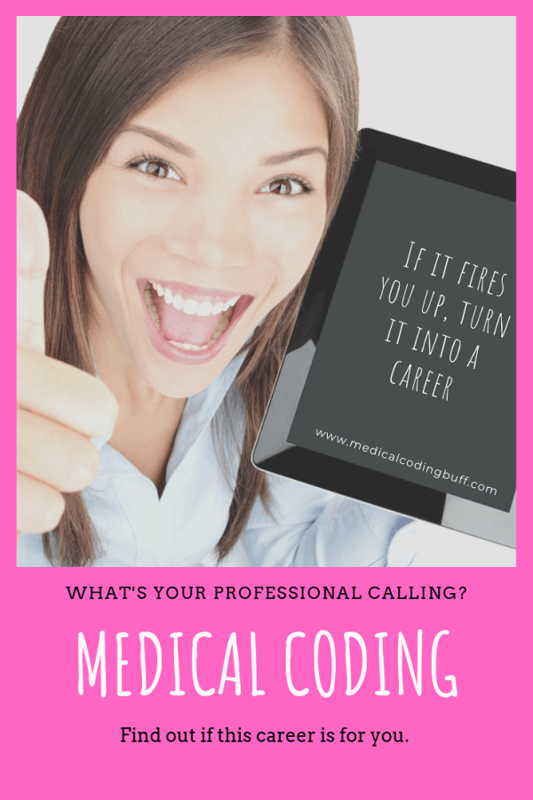 In other words, if medical coding fires you up, turn it into a career! And learn What’s the Difference Between Medical Billing and Coding? In addition, if you want to know if you have what it takes to become an excellent coder, see my article, “Do you possess the 7 Traits That Make a Top-Notch Medical Coding Professional” published by CertificationCoachingOrg (CCO).